You've no idea what mummy is up to this weekend... She's holding a garage sale at the Big Splash flea market! It is just so so tiring. She wakes up early to set up her 'stall', and ends late so that she can sell more of her junks. Haha. It feels kind of good when others would pay for something you don't want. The rental wasn't cheap, even after sharing with Berry Jie jie and Auntie sha. They are running it till this Sunday night. Do visit her... Hee. It was tough to bring me along, so Daddy baby sits me today and tomorrow. I'll only join Mummy in the evening, when the weather's cooler. Buying used items is not a bad idea. Although not for clothes, mummy's perfectly fine with buying used books. She bought some story books for me last weekend, when she went to recce the flea market's venue. Books at 50 cents each! Saw the pop up book? Good grab! And while mummy's earning some cash, Daddy brought a grumpy me for a nearby walk. 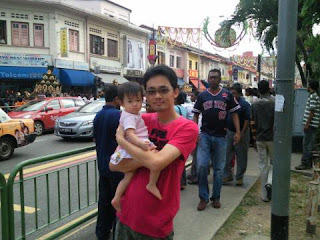 It was a crowded neighbourhood because of Thaipusiam. Yawn... I'm not getting my early nights for being at mummy's garage Sale... Hope this doesn't disrupt my routine. Woah hoo... Mummy's exhilarated, she's over the mountains and the hills! Yesterday marks her last lecture in shcool. One final assignment to conquer, and she's done with her role as a student. It's really an acheivement because this was what she had always wanted to accomplished. It's even more relieved to know that she can now have more time with me than before. Studying will now be something she'll put off for a long long time. The time spent behind books is extremely dreadful. This is true for her - she is no smart woman, but she makes it up with lots of hard work. Success doesn't seem to come by with any shortcut, it's usually a long journey. Now, it's daddy's turn to consider furthering his studies. Make up your mind Daddy! So, it's no more getting busy for shcool, it's all about me now. It's really wonderful to spend time with me. Last week, Mum and Dad spotted me standing unassisted for a few seconds! They're anticipating me to take the first step soon. Dad says 10 months, Mum says 11 months and Jiu jiu says 12 months, or maybe more. And Mummy found this real cute too. The other day, when she picked me from school, there somehow wasn't enough teacher around, a baby was crying badly. Mummy handed me to daddy, and picked the crying baby. She was amazed when I wriggled my way out of his arms, crawled quickly to Mummy, tapping her arms, telling her to carry me instead. She thought this was an interesting sight, and as young as I can be, jealousy does set in. This moment always bring smile in her heart when she thinks of it. It's more cheeky moments with Mummy! Antibiotics has side effects, it leads to diarrhoea. An interesting discovery for Dad and Mum this morning. I had disturbed sleeps because of bad diarrhoea. Poor me, going through a rough week. The doctor didn't alert Daddy that antibiotics may cause diarrhoea until he did some search online and confirmed it with his friend who's a doctor. Daddy's friend advised me to stop on the antibiotics since I'm almost upon its completion, and then get an anti diarrhoea medication from the pharmacy. Last night, I pooed at 3a.m. After which, I didn't sleep well. Mummy's so touched that Grandma came to bunk in with me. It's Sunday, and Mummy could be there for me because it's a no work day. Mums really never stop worrying, once for their children and another time for their grandchildren. Mums are amazing! "Dear God, please let me get well real soon." Everyone's hoping I'll get on the recovery path quickly. I need to be well in order for them to worry less. Mummy has been battling the busy weeks. To add on to her stress, I fell sick last sun. Came down and up with a fever, because of a throat infection. Haiz! When I get sick, everyone worries and don't sleep well because I'll keep waking up in the nights. Grandma had been nice to keep me in her room, so that I won't disturb Mum and Dad. They have to work the next day, and Grandma wasn't working this week. Medication was even tougher for me, I have to be on antibiotics for a week. To get the syrup into my mouth wasn't easy, it's lots of tricks for Dad. Mummy's classes was so intensive, she could hardly spend time with me despite me being sick. She feels kind of guilty for not being able to care for me and she really appreciates Grandma for handling me so well. Well, I got better now, sleeping through the night again. Virus bug seems to be everywhere, it's hard to avoid and there's just as much as we can do. Stay virus free! I've been so hooked onto books recently. Teachers in school second that too! I recalled mummy introducing story books to me when I was 3 months old! Since then, I've love them. Mummy has been buying English story books for me, until Grandpa and Grandma warned her to introduce Chinese language to me. 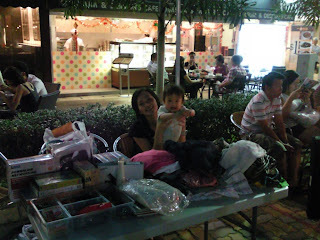 That was when mummy starting conversing more in mandarin to me and starting buying chinese books for me. It's really important to be a master of at least both languages in our country. Whatever the language, I love all the books Mummy bought. The colourful pictures are always catching my attention. Story telling session is fun for me, I will really pay attention! But, sometimes this will be dreadful for Mummy when she's lazy and tired. Chinese story and educational books were not easy to choose. Some are imported from China and some from Taiwan. In China, modern chinese writing (简体字) is used. Whereas, it's traditional (繁体字) in Taiwan. We use the modern writing here, so Mummy has to be careful with the books she chooses. Some books even have the wrong translation of Chinese to English words. Faint!!! We held a mini birthday celebration for Daddy last Sunday. We had a sumptous dinner at Zen with Small Jiu and Berry Jie jie, Big jiu was also there with his gf and friend. Mummy thought this costly meal will burn a hole her pocket, bacause birthday boy doesn't foot the bill. At the end, the bill was taken care by Big Jiu. How nice of him buying dinner for the 4 of us! Haha. We then headed home for a cake cutting 'ceremony'. Simple evening! This is Daddy's first birthday with me around. I had less of Daddy and Mummy this week, especially Daddy. He will only be out from camp on Thurs, oow... how I miss him. Daddy had to spend his birthday in camp on Monday, sob sob. But we had it pre-celebrated on Sunday, pictures will be uploaded soon. Mummy is also occupied with her night classes, it's intensive lessons for her this and next week, 4 times a week! Poor her! Well, she had a light-hearted lesson today, Mr Brown came to 'lecture' the class. She likes his jokes. Yesterday and today, it's about assignments after assignments. She's looking forward to spending more quality time with me on those days without classes. Mummy is one who will put off the idea of working late in offices. Working late is sometimes a choice. While having night classes, she realises how little time was spent on me. She could only grab time while sending me to and fro school. This left her committed to having a work life balance along her career path. She doesn't want to be too engaged in something, before she realised I've outgrown some stages of my babyhood. January's hot for birthday celebrations in our family. It was Pillow's birthday yesterday, followed by daddy's on Mon and Big Jiu's on Tuesday. We just got back from Big Jiu's surprise birthday party. We BBQ, and the smell got into my clothes and hair, so stinky. At the party, I had a taste of the chocolate cake. I love it! But but, while eating the cake, i bit off the tip of a plastic fork, this freaked Mummy. She tried searching my mouth for the chipped fork, but to no avail. Though I look fine, she's really worried. Daddy said Mummy's careless... Well, hopefully, I'll poo it out tomorrow. Pillow's birthday cake, Berry Jie jie bought it! Blew the candles and attacked the cake! This night, I finally got to play with Daddy! Reservist kept him so occupied, he only got a Sunday off. The first thing daddy attacked when home was the papers and the "rectangular box" for soccer. Men are men, they never seemed to know a family needs quality time. Hmm. Mummy's glad that SingTel won the EPL bid, because we're on SCV! Which means, no more soccer and there's no intention for switch of provider. Haha. It was a fun filled night! Mummy's been so unwell the past 2 days, fever with a splitting headache. It's been so tough on her. This is especially tedious when I'm waking up at 6am on most days! Goodness, is that the price to pay for sleeping too early? Poor Mummy! 1. Will her parents end up here? 2. Will she end up there? To her first question, she's affirmed to give a "NO". But to question 2? Hmm... Anyway, back to the home trip, Mummy was so filled with emotions. Seeing old uncles and aunties dazing on their wheelchair with some bed ridden, she felt that life is so unpredictable, "you never know". For now, honour our parents! Well, Mummy wants me to honour her, Daddy, Grandpa and Grandma! Or rather, she hopes for a filial me... Future is unknown, so pray and hope. Mummy's prepared to sow diligently into my life, yet managing her expectations on my returns. Having seen the old folks on diapers, wailing like a baby, always assisted, Mummy thought it should be pay back time for their children. But, I guess it could really be choiceless for the family, things are easier said then done. So, staying fit and healthy is a bonus for you and your family! This song touched her, it felt like her life! Haha. The first part singing her childhood, the second part on dating with Daddy, and the final part of her being a mother! What a beautiful song. Wow, what a blessed trip to the old folks since her last visit. She thought, it would be good to bring me there for a look when sense starts getting into me. Haha. 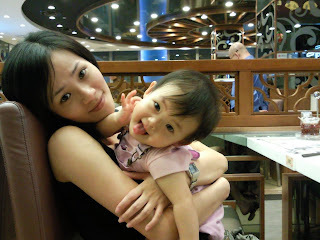 Oh, and thank you auntie sha for coming to fetch me with Mummy and for playing with me after the long tiring home visit. Why is Daddy called back to the army again? Another 2 weeks of battle for Mummy. What's not too good is that classes are starting next Monday for her, it's sure tough because no one can take care of me when she's in school. She's hoping Grandma can take some time off work to help next week. It will be final lap of Mummy's course, and then the end! It had been a dreadful journey. 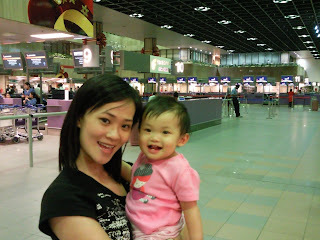 Mummy aside, I'm gonna start missing Daddy, hardly able to see him when he's in camp. Mummy told him, "the house needs a man," Daddy replied, "No man, no country, no home." Haha. Ok, he's positive, happy training! I hit a record late of sleeping at 1a.m. last night and a record late of waking up at 11a.m.! This worries Mummy because she's afraid that my bed time will be delayed gradually. The culprit is the long weekend. We'll go out more often, and go home late. Although we went out around evening time yesterday, we felt like it's a whole long day. 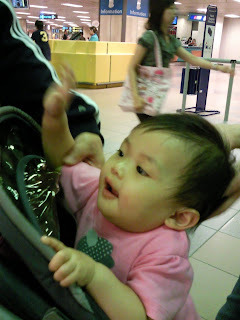 We went Tampines Mall for some shopping and food, then to Ikea and to the airport to fetch Jiu Jiu's girlfriend and her family. They just got back from their holiday and needed help with their luggage and transport. Bringing me out now is no more easy as before. I refuse the pram, I refuse the car seat and I refuse food! Mummy is exasperated. Dad and Mum ended up walking the mall with rotating schedule to carry me in their arms. Now, their arms and back are aching. In the car, Dad and Mum tried to ignore my cry from the car seat, but their persistency failed. I won the battle! Meal time was as bad, I'm picky about what goes into my mouth, if I don't like it, I won't eat. Mum is so upset, not only does it take time to cook but wastage is undesirable. Loud sigh! What's with me now? Having turned 9 months in this new year posed a challenge to Mummy. I'm getting more difficult to please. For misbehaving, Mum and Dad have started raising their voice at me, when it gets too fierce, I'll cry. I've also learnt to understand the word, "No". If I ignore the first few warnings, Mummy will smack my palm. Actually, she knows I'm still too young to understand what's right and wrong, she knows when I'm being smacked and scolded, I am probably not sure what I've done wrong. Anger must have drove her mad. Disciplining is another new level of parenthood. You can't believe this, Mummy told Daddy, "I think one is enough". And mummy is an all time baby lover! Oh no, I want didi and mei mei, I ought to behave. Anyway, I'm sure she was kidding. To welcome 2010, Mummy has been working creatively on our personalised calender. She has also done another one for Grandpa and Grandma! They're so beautiful, especially true when you see my different faces 12 months throughout the year. Haha. Getting this set of calender done is Mummy's greatest worth of time over the long weekend.